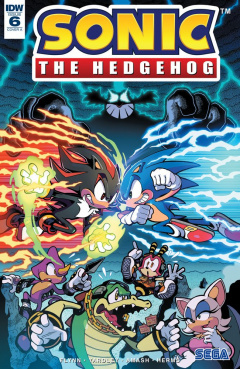 "The Fate of Dr. Eggman Part 2"
Sonic the Hedgehog #6 is the sixth issue in the Sonic the Hedgehog comic series published by IDW Publishing. “The Fate of Dr. Eggman,” Part 2. Dr. Eggman has been located, but Sonic’s not the only one to find him! When Shadow comes, whose side will Sonic be on?! ?